A 2017 study from Opinium showed that Brits spend a staggering £11.6bn annually on gifts, special diets and activities for their furry friends. So, Brits love their pets, and you make sure you provide a great service for clients. Why do I need pet business insurance? Although you pay great care and attention to your work, and it’s probably a passion as much as a job, things can still go wrong. Insurance provides important security for thousands of pet businesses. Whether you’re a dog walker, pet sitter, groomer, or even run kennels and catteries, it can protect your livelihood and get you get back on your feet quickly, should anything happen. What can pet business insurance cover? The first cover to think about is public liability insurance, which is the starting point for any business that comes into contact with members of the public. Check below for all the details on how these covers work. What should my pet business insurance include? If a member of the public claimed compensation for injury or damage caused by your business, public liability insurance can protect you. Say a mobile dog groomer caused accidental damage to an expensive carpet in a client’s home. If the client took legal action, your policy can cover the legal fees and compensation costs. Compensation claims often run into millions of pounds. When taking out a policy, it’s best to have a think about what sort of claim might be brought against you, as the severity of any possible damage or injury can help you decide your level of cover. Most insurers offer between £1m and £10m of public liability cover. Because of the unique risks associated with working with animals, pet business owners do have specific insurance needs. Some insurers can cover injury to pets, as part of your public liability insurance. This means that if a pet was injured or became ill while in your care, your policy could protect you from a customer claim. This type of cover forms part of an insurance policy for many pet business owners looking for more tailored protection, so look out for it when getting a quote. If your pet business has any employees, you may be legally required to have employers’ liability insurance. If you need it and you don’t have it, you face a £2,500 fine for every day you’re not insured. It covers you if an employee becomes ill or injured because of your business. If you have staff, it usually fits alongside public liability insurance as one of your key covers. 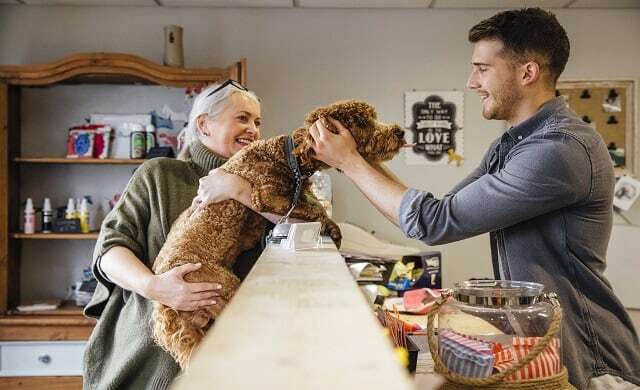 If you run your pet business from a home or a separate premises and you’re responsible for insuring the building (rather than a landlord), this might be the next cover to add on to your policy. Buildings insurance usually covers the cost of repairing damage to the structure of the property. It can also cover fixtures and fittings, including carpets, skirting boards, and curtains and blinds. And if you run a pet shop or grooming parlour, for example, you might want to cover your shop front as part of the policy. If you have a business premises, it’s worth thinking about getting a quote for your contents and stock, too. That way if something was damaged or stolen, your policy would pay out for replacements, allowing you to get on with your bookings and to-do list. As a pet business, it’s likely you’ve got some specialist equipment. Dog groomers have specific hoovers and brushes, while pet sitters have all kinds of equipment on hand for the different animals they have in their care. But if your equipment was damaged, lost, or stolen, how quickly would you be able to get back on track? Having insurance in place can help you recover from a setback quickly, and with minimum disruption. If you’re a mobile pet business, and spend time visiting clients, you face an increased risk of having an accident. Costs incurred by accidents are often significant, and personal accident insurance could protect against serious injury or even death caused by one inside or outside of work. The money paid out can help with things like medical costs and bill payments, which might be difficult to meet. You can get insurance from several places, and using a service that compares quotes from a large number of insurers makes things quick and easy. Online broker Simply Business provides specialist business insurance for over 425,000 UK customers, with a quick and easy online quote form and lots of options for pet businesses. You can compare quotes from a panel of insurers, tailoring your policy to fit your business. Get your details ready, answer a few questions about your business, and you’re all set.